The CTD (conductivity, temperature, and depth) instrument is the backbone of the Bermuda Atlantic Time-series Study (BATS) program, collecting a variety of physical, chemical, and biological oceanographic data from the North Atlantic Ocean on a monthly basis. Over time, these data points form a time-series, which allow scientists to examine trends in a variety of research areas, including the global carbon cycle and climate change. Funds granted in May by the National Science Foundation will allow BIOS scientists to continue their research through 2023 at the Bermuda Atlantic Time-series Study (BATS) site, a project established in 1988 by BIOS and collaborators to examine the “time-varying” components of the ocean carbon cycle, ocean physics, and biology. Scientists undertake this work by collecting water samples each month at the same site in the open ocean nearly 50 miles (80 kilometers) off Bermuda, then analyzing hydrographic, chemical, and biological parameters throughout the water column. Scientific colleagues and students from around the world also join BATS cruises to undertake associated research, and many use BATS data to investigate a variety of topics, including ocean physics and biogeochemistry, the global carbon cycle, and the ocean’s response to climate change. Oceanographers travel to the BATS site using the BIOS-operated vessel Atlantic Explorer, and once there, lower a shipboard CTD (for conductivity, temperature, and depth). It’s the primary tool for determining essential physical properties of seawater at a variety of depths and gives scientists a precise and comprehensive charting of the distribution and variation of water temperature, salinity, and density that helps to understand how the oceans affect life. 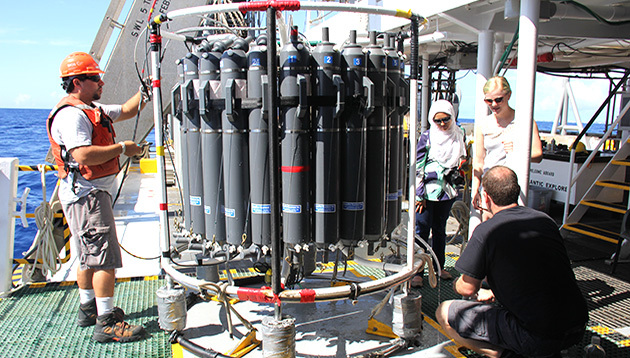 Additional sensors attached to the CTD also provide information on light attenuation, or how light is reflected or refracted through the water column; suspended particles in the water column; and chlorophyll biomass, which helps scientists determine the amounts of plankton and phytoplankton in the ocean that form a base of the food web. “Over the past five years, we have collected thousands of CTD profiles on about 80 cruises” said chemical oceanographer and professor Nicholas Bates, a senior scientist at BIOS and a lead investigator on the project with BIOS assistant scientist Rod Johnson. This includes at least 60,000 samples analyzed on the physics, chemistry, and biology of the North Atlantic. In the last five years, 50 to 60 scientific papers have been published using BATS data, Bates said. Also during that time, 15 to 20 university-level students have had the opportunity to participate on a BATS cruise, which includes hands-on laboratory, cruise, and data synthesis activities. “The BATS program will continue to directly aid the U.S. national effort to improve the understanding of the oceanic carbon and nutrient cycles and the impact of ocean change,” Bates said. BATS complements other Sargasso Sea time-series studies: the Oceanic Flux Program, a deep sediment trap mooring in place since 1978, and Hydrostation ‘S,’ a hydrographic time-series sampled approximately biweekly since 1954. The renewed funding announcement comes a little more than a year after NSF awarded $4 million to continue supporting work at Hydrostation ‘S.’ In 1954, scientists established this station 15 miles (25 kilometers) southeast of Bermuda to regularly measure and report on ocean salinity, temperature, and carbon dioxide from the surface to the seafloor, nearly two miles (3,200 meters) deep. When combined, data from BATS and Hydrostation ‘S’ provide the longest record available of ocean warming. As such, it demonstrates the loss of oxygen from the surface ocean due to climate and environmental change, and it is the longest record of the uptake of human-caused atmospheric carbon dioxide inputs to the sea, as well as changes in ocean chemistry through the process of ocean acidification. “The observations off Bermuda provide the global community with an unparalleled suite of comprehensive scientific data and findings showing how the physics, chemistry and biology of the oceans have changed over the past 65 years,” Bates said.